Comics In 5 Panels: Manga-Mania May: Aoi Destruction. Tetsou's mother died when he was 7, so he's been living with his father Aoi for ten years. The upbringing has been... odd, since Tersou's father looks like(and also acts like) a little girl. It's not that Tetsou doesn't love his father, he is just pissed over that pretty much all the boys in town has a crush on his "trap" of a dad, witch has made him the tough-guy of the town, so he can scare away all the guys from his father. Problem is, that his mother's karate-dojo is not doing very well, since no one wants to be beaten up by Tetou. And duo to Tetsou's reputation as the toughest guy in town, he is the target of all kinds of gangs who wants to beat him up. No wonder he is pissed over his father being so girly. This is the story about a father and son relationship you have never seen before, as we see Tetsou and Aoi doing everything they can to keep life in the mother's karate-dojo, and live out her dream. The story i three chapters long, but the manga also has 3 other stories in the form of one-shots. Then we have the story about Yoshizaka. He is the most popular guy on his school, and all the girls are crazy about him, But one day comes a new girl to his campus who knows his greatest secret: That he was once a master of wooden figure making. And last, but not the least, we have the tale about a young samurai woman named Otone, who does all she can to defend her dead fathers dojo. She is armed with a sword, possessed by the spirit of a dead warrior, and the sword represent his... well, "sword," if you get me. Let me put it this way: it only works in the hand of a "good woman". This story about the young warrior woman and her perverted sword is my favorite of the bunch. 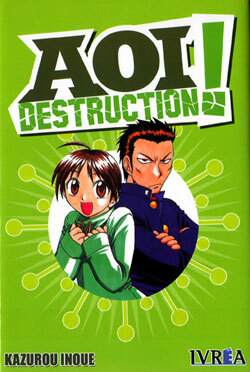 Aoi Destruction is written by the manga-genius Inoue Kazurou, and all the stories are just as great and just as weird as his other works, such as Midori Days, witch I reviewed two days ago(here is a link: Midori Days). One down, 9 to go.